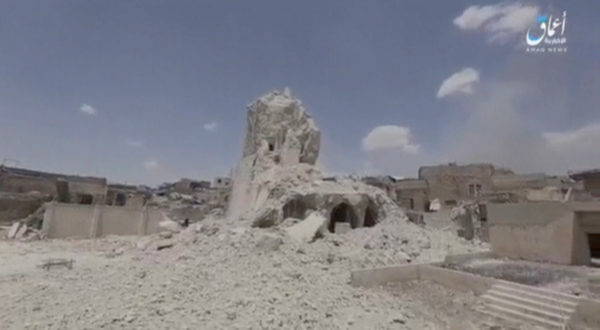 A still image taken from a video shows Grand al-Nuri Mosque site destroyed. Video said to be shot in Mosul, Iraq, on June 22, 2017. The iconic leaning minaret of the Great Mosque of al-Nuri has stood over Mosul for 800 years. But on Wednesday, one of the most iconic religious sites in the country came crashing down as the Iraqi army fought to take the city back from Islamic State militants. What happened to al-Nuri mosque? The Islamic State’s Amaq News Agency quickly argued the mosque was destroyed in a U.S. airstrike. But the U.S.-led coalition denied that, suggesting instead the Islamic State had blown up the mosque as they retreated. Grainy video footage released by Iraq’s joint operations command to reporters appears to offer the best chance to assess these competing claims. The footage appears to have come from cameras the Iraqi army set up along the Mosul frontline to watch the Islamic State’s positions. After reviewing the video, a number of explosive experts said the blast appeared to have come from within the building rather than an airstrike that might have struck from above. “I cannot imagine how an airdropped bomb could produce the effects shown in the video,” Sidney Alford, chairman of Alford Technologies Limited and a leading expert in bomb disposal techniques, said. “There is no evidence of an impact before the explosive occurs,” added Neil Gibson, a senior weapons analyst at Jane’s, suggesting this pointed away from an airstrike. It is not clear if the Islamic State planted these explosives in the building or why they would deny doing so if they did. However, there had long been rumors that the group had planted bombs in the mosque; its fighters have also deliberately destroyed or damaged many other religious buildings and artifacts in Syria and Iraq, in large part due to a fundamentalist view of Islam that radically opposes idolatry, theological experts and the group itself claim. The Great Mosque of al-Nuri may also have held a symbolic significance in the fight for Mosul. It was also the location of the first and only public appearance of Abu Bakr al-Baghdadi, the Islamic State’s leader, three years ago. Speaking to The Washington Post, Hassan Hassan, a senior fellow at the Washington-based Tahrir Institute and co-author of “ISIS: Inside the Army of Terror,” suggested that this meant the loss of the mosque would have been a blow to the group’s image. “It would have been the most symbolic blow within its most symbolic stronghold,” Hassan said. Alford also suggested that there had been a number of charges within the structure linked with detonating cord. “It seems that a series of four or five large explosive charges – at least several tens of kilos – was placed at internals up the tower, with a larger amount left at ground level,” he said. The black smoke of the explosion suggested that the explosives used were of a military level and may have been based on TNT, Alford added. A number of TNT mines have been found in Islamic State training camps near Mosul. On Twitter, some argued that the video released Wednesday actually showed a previous incident – with many pointing to the 2014 destruction of the Nabi Yunus shrine by the Islamic State. Comparing the two videos, Gibson said that the demolitions themselves do seem to be pretty similar, with charges within the mosque and several on the minaret. And while the quality of the video is poor, Iraq’s joint operations command’s footage does appear to show the unique aspect of the al-Nuri mosque: It’s now-destroyed slanting minaret.